If you are planning an adoption shower, I’m sure you have discovered there are little or no adoption-specific supplies readily available. Standard baby shower supplies can be useful if throwing a shower for an infant, but “IT’S A BOY” or pink stroller and baby bottle decorations are not exactly appropriate when celebrating the adoption of a pre-teen or teenager. Also, with the many uncertainties that come with adoption process, adoption showers are often celebrated after the adoption is finalized and the child(ren) can attend the party as well. a celebration of family and mother/parenthood. But with an intercountry adoption shower, you also celebrate the merging of different cultural backgrounds into one family. The adopted child’s country is part of his/her life story and has special meaning to the adoptive parents who spent a significant amount of time in the country. The adoptive parents’ country becomes a new chapter in the adoptive child’s life story, and over time, s/he will start to feel at home in the adoptive country. 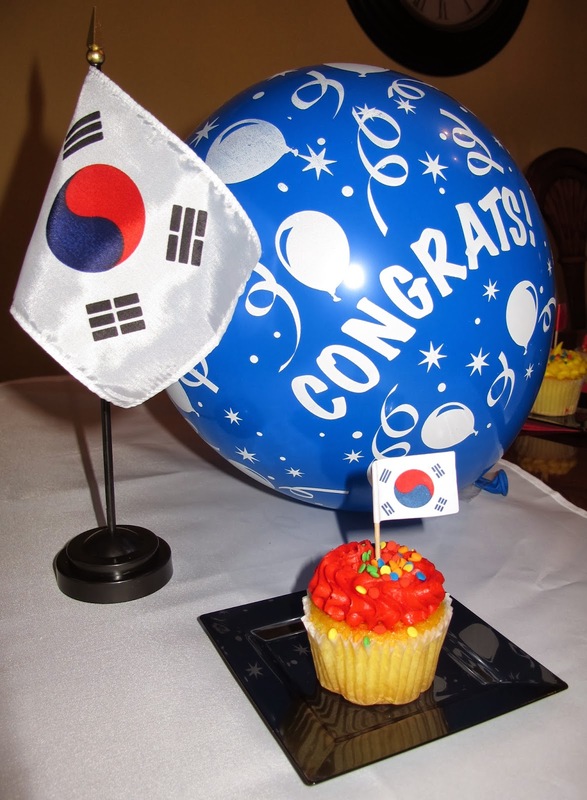 A creative way to celebrate an intercountry adoption shower is to incorporate country flags. You can do this either directly (using the actual flag in your decorations) or indirectly (simply using the flag’s colors, but not the actual flag). The great thing about this approach is that you can fit your designs within your party size and budget, whether large or limited. You can limit your decorations to a simple one-table center piece or color-coordinated streamers, or coordinate dessert tables and cupcakes with elaborate decorations and matching guest goodie bags. Over the next couple of blogs, we will outline some specific ideas for table center pieces you can dress up or down, as well as creative suggestions for cupcakes and guest goodie bags. We will also offer some original ideas for domestic and foster-to-adoption showers. There are so many things to cover, we can’t wait to share them all with you. If you have any creative ideas, please post them on our blog, our website (www.adoptedwithlove.com) or email them to us and we will discuss them with your permission. The more the better!